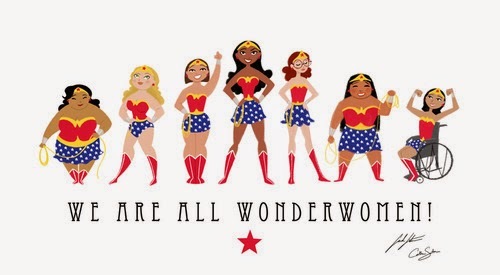 First time i saw those picture above, i feel like no matter how we looks like in shape, all women are wonder women with their own way. Sometimes i feel so fat every time i see a perfect one Jodilly Pendre. But hey, the great One Allah SWT has created me as a perfect one. 165cm height with 57kg weight and i still feel i am really a big one. How dare i am for not being thankful until this day. Who said that one of you is imperfect? Which part you feel that you are imperfect one? Every time you think that you are not able to do kind of things which others can do, you are perfectly wrong. Did you ever think there's something couldn't be done by others except you? Did you ever think that you are able to climb a mountain which others can't do? "Every inch of you is perfect from the bottom to the top" sing by Megan is completely right. You have a beautiful life with a warm family, surrounded by beloved best friend, ability to do every thing (because "i can't" is not an answer you have to say), a spirit that keep you alive until today. Absolutely, you just like a wonder women who fight for your happiness, exactly with your own way. Because life is not "life" without a messy path.